Innovation isn’t a word commonly used to describe oyster farming. When the owners of Pensacola Bay Oyster Co. explained the innovation and research that lies beneath the surface of this new industry, they secured first place – and the $100,000 cash prize – at the 2017 Innovation Awards. The Innovation Awards is Florida’s most lucrative business plan competition. At the end of the competition on April 13 at the Hilton Pensacola Beach hotel, 12 companies walked away with cash and prizes that will help them to continue to grow their businesses. Jim McClellan, chairman of the board of directors of Innovation Coast and marketing director of AppRiver, said the competition was the culmination of a long and exhaustive process for the finalists. 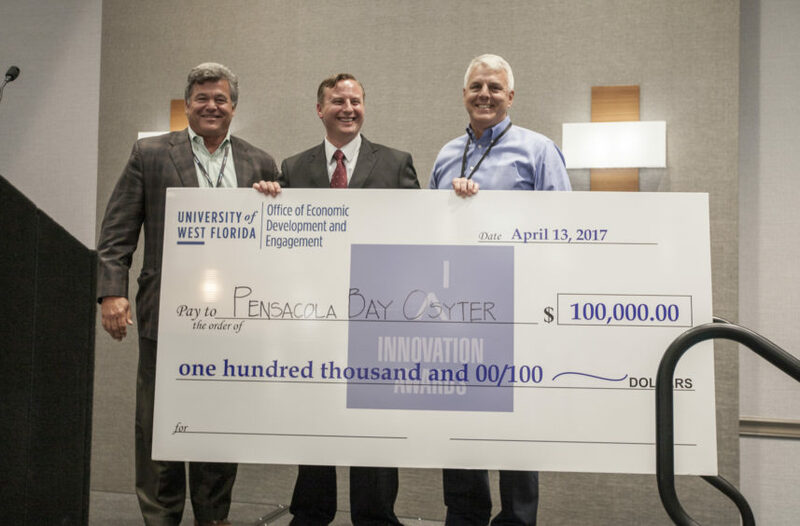 Pensacola Bay Oyster Co.’s owners Donnie McMahon and Doug Ankersen will use the prize earnings they received from the University of West Florida’s Office of Economic Development and Engagement to expand their oyster hatchery and create clean, high-skilled jobs that grow the region’s economy and improve the environment. It also hopes to position Northwest Florida as a hub for aquaculture research, innovation and investment. They will also receive a six-month membership for Vistage Florida’s coaching and mentorship program. In the post-revenue category, second place went to NumNum, an emerging baby brand based in Pensacola, and received $50,000 from UWF’s OEDE; and Robotics Unlimited, Inc., a company bringing cutting-edge robotics to the toy market, placed third and received a two-hour consultation from S. Nevin Shaffer, an intellectual property law attorney, and meeting space at Co:Lab. In the pre-revenue category, first place went to Cognitive Big Data Systems, developer of a computer vision app that allows machines to learn and build memories, received $25,000 from Innovation Coast; NeuBev, a startup that developed an eco-friendly smart water cooler, placed second and received $15,000 from Innovation Coast; and Fast Informatics, a startup using machine learning to makes sense of data, placed third and received meeting space at Pensacola Socialdesk. In the veteran category, first place went to Mine Survival, Inc., a manufacturer of respiratory escape systems, and received the $10,000 Landrum Veteran Award; Invictus Knowledge Institute, a non-profit offering advanced technology training and development, placed second and received $5,000 from AppRiver; Naggy, an app that motivates kids to complete chores, placed third and received meeting space from Venture Hive in Fort Walton Beach. In the student category, first place went Halo Technology, an app that uses location-based augmented reality technology, and received $5,000 from AppRiver/Office 365; Stadium Finder, an app that allows users to order concession stand food from their stadium seats, placed second and received $2,500 from Innovation Coast; and HomeTheater, a service that will allow virtual reality headset users the convenience of watching new movies from the comfort of home, placed third and received a five-hour consultation with business entity law by Kimberly Sullivan of Moore, Hill & Westmoreland. The 12 finalists were chosen out of 61 companies that registered for the Innovation Awards. The five judges representing the technology sector, finance, military, academia, and corporate leadership were: Joel Smith, chief technology officer at AppRiver, Kathy Chiu, managing director of the FAN fund in Orlando; Vernon Niven, president of Buy Like Me; Kathy Anthony, Northwest Florida chair for Vistage Florida; Tommy Tait, president of the Pensacola market for Summit Financial Enterprises.